A day after my Monmouth escapade, I promised to meet a 3-week old friend so we can say our goodbyes before he flies back to his mission place. He spent four weeks vacation in London and one of the last items in his London’s bucket list is to see one of Vermeer’s painting, which is reported to be part of the Royal Collection and is in fact, included in the treasures featured in this years opening of the State Rooms. Buckingham Palace only opens its doors to the public during summer – so call it being at the right place and at the right time, and by virtue of empathy, I sincerely showed interest and started to induce art and culture to my pedestrian consciousness. Before buying our tickets, we had to ask members of the Buckingham staff whether Vermeer’s painting is indeed included in the things we will see inside. I wish I know something about Vermeer. I wish I could even spell his name as I had to ask my friend to spell it for me. Forget about the fact that we will be able to walk in the Grand Staircase where footprints of royalties, aristocrats, head of states and diplomats are indelibly found – I had to remind myself that seeing Vermeer’s painting is the most important. Ignore the fact that I will be able to smell and touch the State Dining table, where each Sevres porcelain are arranged in precision, that the distance between cutleries are measured using rulers and Her Majesty personally checks it before grand occasions such as State dinners – I had to remind myself that finding one of the 34 known paintings of Vermeer will be the highlight of our visit. It is not so important to see the Throne Room where through centuries, it hosted and continues to host audiences of all nationalities, receive homage, award high honours and perform other royal functions – I had to remind myself that paying homage to Vermeer’s painting is our day’s mission. Soon as we entered the 55-yard long picture gallery where paintings of Rembrandt, Van Dyke, Rubens and many others are displayed, in a split second, my friend found Vermeer’s painting, called ‘The Music Lesson’. I hurriedly looked at it and quietly exclaimed, ‘Ah, oh-K’. Felt like the smell of paella and curry in the Borough market 24 hours ago made my heart beat faster than seeing one of Royal Collection’s most valued possessions. Thank goodness for the audio guide provided, I quickly pressed the number for Vermeer’s painting and listened to what it is all about. I did not listen to it just once, I listened to it three times until I found myself not just looking at the painting, I found myself reading, feeling and almost tempted to touching the painting. Vermeer is known with his exquisite and masterly treatment and use of light. 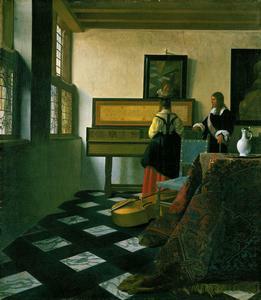 The audio even said that one could feel the air and space in Vermeer’s paintings. If espresso just gave me less than a minute of pleasure, I made sure that the visual appetite I had during that moment will be rightfully satisfied so I took as much time as I possibly can adoring Vermeer’s work. I will not profess to have been converted as an art enthusiast after my Vermeer experience but I acknowledge that our life is indeed surrounded by so many things unknown and unfamiliar to us – just like Vermeer and his paintings. Most will sometimes appear nameless, meaningless and even useless – only when we pay attention will we realise the great treasures within our midst.